Justus von Liebig is regarded as the founder of organic chemistry. He was the son of a drysalter and hardware merchant and was educated in Darmstadt before he became an apothecary's apprentice in Heppenheim. Later he studied with Karl Wilhelm Gottlob Kastner at the University of Bonn and he followed Kastner to the University of Erlangen. After he received a grant he was able to study with Joseph Louis Gay-Lussac in Paris. Kastner took care that he was promoted in absence in Erlangen in 1823. In 1824 he returned to Darmstadt and with the help of his Alexander von Humboldt he became a professor in Giessen. There he worked for over 25 years and he gave a new impulse to chemistry research in Germany. In 1826 he had married Henriette Moldenhauer, the daughter of a state official. In 1831 he isolated a substance that he named chloral and this led to the use of chloroform a few years later. In 1832 he founded the journal Annalen der Chemie that he edited with Friedrich Wöhler until his death. In 1845 he was enobled by Ludwig II of Hessen. He developed a beef extract of which the details were published in 1847. In Europe meat was too expensive to produce the extract commercially, but he in 1865 he became scientific director of Liebig's Extract of Meat Company based in Uruguay. In 1852 he obtained a professorship in Munich and in 1860 he became the president of the Bavarian Academy of Arts. He was a personal friend of king Maximilian II but after the king died he and other protestant scientists were opposed by the Catholics. He died in 1873 and was buried at the Alte Südfriedhof in Munich. 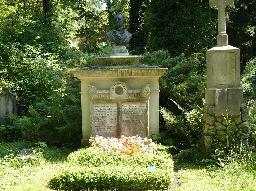 The grave of Justus von Liebig at the Alte Südfriedhof, München.